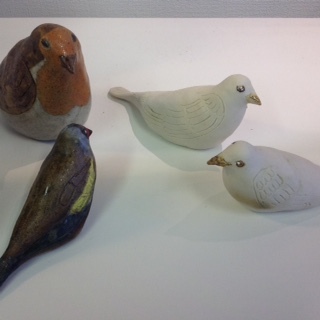 Sonja creates vessels, ceramic birds, pendants and plaques using porcelain, stoneware or earthenware clays. They are decorated by pouring or painting on to the surface with coloured slips or glazes. Her vases and bowls and are thrown or coil built and are painted, incised or sprigged. The birds, pendants and wall plaques are hand modelled, each piece being individually made, and then fired in an electric kiln. They are inspired by and drawn from the landscape, plants, trees, animals, birds and insects. Sonja's workshop is on a farm, the surrounding natural landscape being of special interest. She is aware and concerned about the disappearing landscape. Childhood memories and narratives are captured in her ceramic art as well as incidents from recent travels. Sonja holds clay workshops for individuals or small groups, email sonja@sonjakuratle.com. Website sonjakuratle.com.